Hundreds of protesters have taken to the streets in several areas across Bahrain to vent their anger at the ruling Al Khalifa regime’s crackdown and attacks against political dissidents. On Wednesday evening, demonstrators staged a rally in the town of A'ali, situated about three kilometers (1.8 miles) southeast of the capital, Manama, shouting anti-regime slogans and demanding the downfall of King Hamad bin Isa Al Khalifa. Elsewhere in the northwestern village of Diraz, 12 kilometers (7 miles) southeast of Manama, demonstrators stressed that they would continue with peaceful protests for the fulfillment of their democratic demands. Protesters also marched along streets in the village of Abu Saiba, west of the capital, holding portraits of Sheikh Ali Salman, who heads Bahrain’s main opposition bloc, al-Wefaq National Islamic Society. They denounced Saudi Arabia's military presence in Bahrain and chanted slogans against the Al Saud regime. A similar anti-regime demonstration was held in the village of Muqaba, where protesters condemned the regime’s heavy-handed crackdown against dissidents. They also demanded the immediate release of all political prisoners. 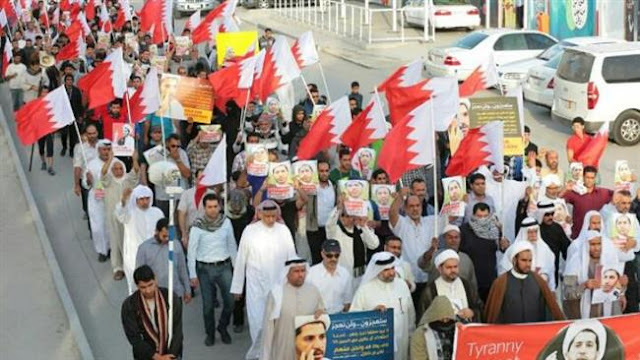 Since February 14, 2011, thousands of anti-regime protesters have held numerous rallies on an almost daily basis in Bahrain, calling for the Al Khalifa family to relinquish power. Scores of people have been killed and hundreds of others injured or arrested in the crackdowns. Amnesty and many other international rights organizations have frequently censured the Bahraini regime over the “rampant” human rights abuses against opposition activists and anti-regime protesters, Press TV reported.